Today, I have for you all another delicious, easy, slow-cooker recipe for pork. 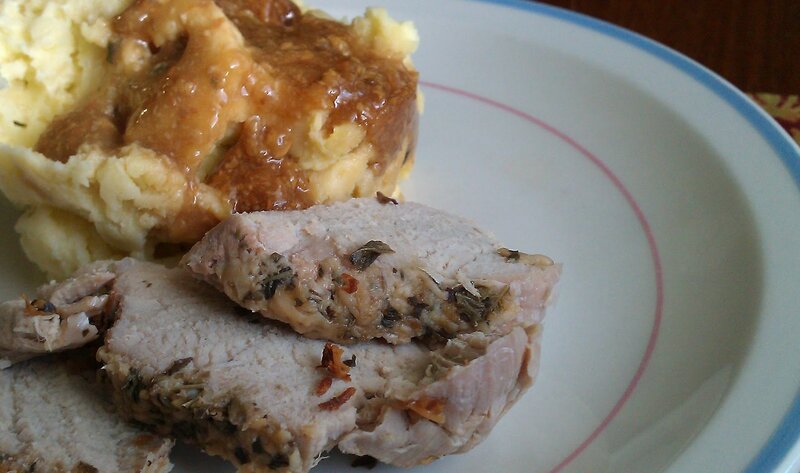 This may be my first official Pinterest post on We Meat Again, as that is where I found this original recipe for Parmesan Honey Pork Roast, pinned by my dear friend Lindsey, who is the working momma of a growing toddler, and therefore, in need of many quick and easy recipes. Linds, if you haven’t tried this one yet, you should. The prep time for this is as simple as mixing up the sauce and tossing it all in the crock pot. 15-20 minutes max, and dinner’s served later that night. The suggested cook time is 6-7 hours. With the same liquid ratio, at seven hours, my one-pound tenderloin was a bit dry. I might try the shorter end of that time, or keep on warm for the last hour or so. Just make sure to check that the meat is cooked through. This may be the first time I suggest a recipe modification, but … I don’t really get the Parmesan cheese in here. I mean, I love parm, but I felt I could taste it too much in the gravy, and next time, would likely just leave it out and let it become a more tangy, Asian-flavored roast. Speaking of gravy, definitely take the time to make the cooking liquid into a gravy and serve it over mashed potatoes. That was probably my favorite part (though this does need to be done 20 minutes or so before the roast is ready, if you opt for homemade mashers). Also speaking of Asian flavors, I used sesame oil instead of olive oil, and thought that worked really well here. And there you have it. Another Marissa-tested slow cooker recipe for a yummy-smelling house with little effort. Enjoy!